The government is going to tax the hell out of your e-juice. For state governments, when you make the switch to vaping, you go from a moribund source of revenue to a normal citizen, only paying tax, you know, on everything you earn, save and spend. You might be almost certainly extending your lifespan and dramatically improving your health by making the switch to vaping, but apparently state governments are a little more concerned about the tax money they’re losing out on as a result. But that won’t last for long, because they’ve found the easiest way to keep gouging you for extra dollars: taxing vaping. Taxes on vaping have been proposed in many states already, and as a post by Americans for Tax Reform shows, four states and several localities have already approved taxes. Many other states have bills pending, and even more will undoubtedly impose them in future. So where is vaping being taxed? Why is it being taxed? How exactly are the taxes being applied? Is a “sin tax” on vaping really justifiable? And, most importantly of all, what are the likely consequences of taxes on vaping? Here’s everything you need to know about e-cigarette taxes. How Do You Tax Vaping? Before we look at the deeper issues surrounding “sin taxes” – particularly when applied to vaping – let’s take a look at how taxes on vaping work and we’re they’re being applied. There have been a few key approaches attempted to tax vaping so far. The first, and a very common approach, is to tax the wholesale price of vaping products at a fixed percentage rate. For example, a vape store buying in some vaping products wholesale in Iowa will have to pay an additional 50 % in taxes if the proposed tax is passed. This is a cost for the vendor, but it will still undoubtedly be passed on to ordinary vapers so stores can remain profitable. A related approach is to tax at a percentage of the retail price for vaping products. This is much the same as the wholesale tax, except that the chosen percentage is applied to the retail cost rather than the wholesale cost. An example is a pending bill in Washington, which would apply a 60 % tax to the retail cost of vaping products. So that $100 mod you’re considering will cost you $160 instead, with over a third of the money going straight to the government. However, taxing the vaping product doesn’t make as much sense as taxing the actual e-juice, since that’s where the nicotine – and hence the “sin” – resides. Taxes on e-liquid generally take a “per milliliter” approach. For example, North Carolina and Louisiana both have 5 cent per ml taxes on e-liquids. This means that a 30 ml bottle of juice, ordinarily priced at, say, $15, would cost $16.50. This doesn’t work out too badly, but when the per ml tax goes up, the price skyrockets. In Kansas, the 20 cents per ml tax would raise the price of a 30 ml bottle of juice by $6. In Chicago, the 55 cents per ml tax would equate to $16.50 in tax (not including the actual price) for a 30 ml bottle. Finally, there’s another approach that really hones in on the apparent “sin.” The tax proposed in New Mexico is four cents per mg of nicotine. This might not seem too bad, but you have to remember that the mg/ml amount of nicotine in e-juice is the amount in a single ml of e-liquid. This means that a 24 mg/ml e-liquid would have a tax of 96 cents per ml, reaching almost $29 in tax alone when you scale that up to a 30 ml bottle. Which States and Local Governments Have Taxed Vaping? 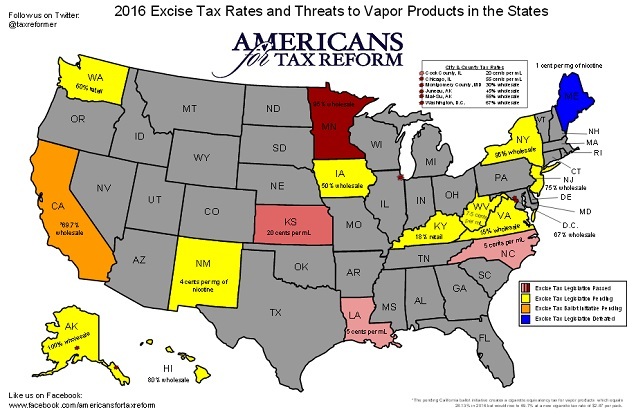 The states colored yellow or orange have proposed taxes on vaping products, the states in a shade of red or pink have passed taxes on vaping products, and the lone state in blue (Maine) has rejected a bid to tax vaping. Kansas: 20 cents per ml of e-liquid. Louisiana: 5 cents per ml of e-liquid. Minnesota: 95 % of wholesale price. North Carolina: 5 cents per ml of e-liquid. Cook County, Illinois: 20 cents per ml of e-liquid. Chicago, Illinois: 55 cents per ml of e-liquid. Montgomery County, Maryland:30 % of the wholesale price. Juneau, Alaska: 45 % of wholesale price. Mat–Su, Alaska: 55 % of wholesale price. Washington, DC: 67 % of wholesale price. Alaska: 100 % of wholesale price. Hawaii: 80 % of wholesale price. Iowa: 50% of wholesale price. Kentucky: Conflicting reports – Americans for Tax Reform says the proposed tax is 18 % of the retail cost, other sources say 15 % of the wholesale price. New Jersey: 75 % of wholesale price. New Mexico: 4 cents per mg of nicotine (postponed indefinitely). New York: 95 %of wholesale price. Virginia: 15 % of wholesale price, according to Americans for Tax Reform. The only bill I can find is a proposal for a 40 cent per milliliter tax. Washington: 60 % of retail price. West Virginia: 7.5 cents per ml of e-liquid. *Note: For proposed taxes, we’ve looked for further confirmation beyond the post by Americans for Tax Reform, and linked in the relevant section. For Alaska, no confirmation could be located. The only question is: does “sin tax” really make any sense for vaping? Smoking kills people, so encouraging people to quit makes a lot of sense. It’ll probably mean less people die. Additionally, research has shown (p350) that imposing taxes is effective in bringing down the smoking rate, so taxing cigarettes seems like a good approach from this perspective. Raising the cost of cigarettes by 10 percent leads to a 3 to 5 percent reduction in the number of cigarettes sold and up to a 3 percent decline in the smoking rate. The same basic arguments are made for taxing alcohol (as well as, increasingly, fatty foods and sugar), and the same basic conclusions apply. However, there are several issues with the whole “sin tax” approach – and particularly the justifications for it – raised by Christopher Snowdon in the report the Wages of Sin Taxes. The short version is that the justifications for the taxes – most commonly, that the “sinners” in question cost society money – are faulty. The analyses used to justify this account for intangible costs – like “emotional distress” – and don’t take into account cost-savings to society – from smokers dying earlier, for instance, and not needing as much healthcare in old age or claiming as much in pension payments as a result. It’s a little grim to count dying younger as a saving for society, admittedly, but that doesn’t stop it from being true. The taxes also only have a limited effect on use where it matters most –since severely addicted people, those most in danger, will probably just spend more to indulge rather than quitting. Finally, the taxes have a disproportionate and damaging effect on the poor. But sin taxes maintain their appeal for simple reasons. Firstly, governments like money, and taxing products like cigarettes and alcohol is a great way to raise a lot of it. Secondly, it’s quite easy to sell to the public, because not all of them will have to pay the tax, only the “sinners.” Moreover, the moves are usually (incorrectly) pitched as a way to offset the costs to the “saints” (i.e. non-indulgers) in society from the sinners’ habits. Effectively, the attitude is “just tax the smokers; they shouldn’t be doing it anyway.” It’s moralistic and paternalistic, but it’s a much easier sell than raising income tax. Is Vaping Really a “Sin”? So, back to vaping and the obvious question: is vaping “sinful”? Should we be taxed for quitting smoking using an approach that somebody, somewhere has decided is sufficiently enjoyable to justify charging us extra money for? It would be virtually impossible to imagine a sin tax being levied against long-term users of nicotine gum, but because vaping is an inherently pleasurable pastime, we’re seen as targets for the latest round of government fund-raising. The Tobacco Control Legal Consortium has an FAQ document that attempts to address the question of “why tax e-cigarettes?” However, the answer is just a limp appeal to the harms and addictive nature of nicotine, as well as pointing out that the nicotine in e-cigarettes ultimately comes from tobacco. This is about as weak as justifications get. It amounts to saying that something which is much safer than cigarettes, and which – for the good of smokers’ health – we should be encouraging switching to, should be taxed as a sin because it isn’t completely safe. To recap, sin taxes aren’t justified on the grounds they’re pitched to the public on – much less for vaping, since it’s considerably less harmful than smoking – and it takes quite a substantial rise in price to have a modest impact on usage rates. How could this get any worse? The reason is obvious. One of the big benefits of vaping, and one of the reasons many smokers are drawn to it, is that it saves you money in comparison to smoking. It doesn’t do quite as good a job on the nicotine front, though, and although vapers generally start to prefer vaping to smoking, for a smoker it might not be that appealing. However, alongside reducing the risk from your nicotine habit, the cost-savings are a pretty big part of the appeal. The fact that sin taxes generally reduce usage will almost certainly continue to be true for vaping. The only difference is that the big market for e-cigarettes is smokers. By raising the price through taxation, the result will undeniably be fewer smokers deciding to make the switch and more continuing to smoke. When coupled with the constant stream of negative information and the perverse focus on the potential risks of vaping, it could easily create a pretty powerful disincentive to start vaping. Perhaps a few teens wouldn’t try vaping (“try” because regular use in non-smoking teens is near non-existent), but plenty of smokers (adult or teen) won’t make the switch. And what’s the benefit? Oh, that’s right: states get their tax money. Even if it means making quitting smoking more expensive, that’s what appears to be the most important thing for these governments. There are a lot of accusations that states are too dependent on tobacco tax revenue, and that this is a key motivator for the opposition to vaping. Needless to say, the states that have moved to tax vaping are doing a pretty good job of providing supporting evidence for this idea. States will keep taxing vaping. It’s just too easy a way to make money. But don’t hold out any hope for this changing attitudes towards vaping. The popular theory that dwindling tobacco tax revenue is responsible for the opposition to vaping would suggest that once taxes are in place, we’d see a more positive attitude towards vaping from states like California. But this doesn’t really capture the whole picture – there are many reasons people oppose tobacco harm reduction – and money is just one of them. The result of all this won’t benefit vapers and it definitely won’t benefit smokers yet to switch, but it might slightly reduce the (not that serious) issue of non-smoking kids vaping. So there’s that. All we can really say is: vape on, fellow sinners.